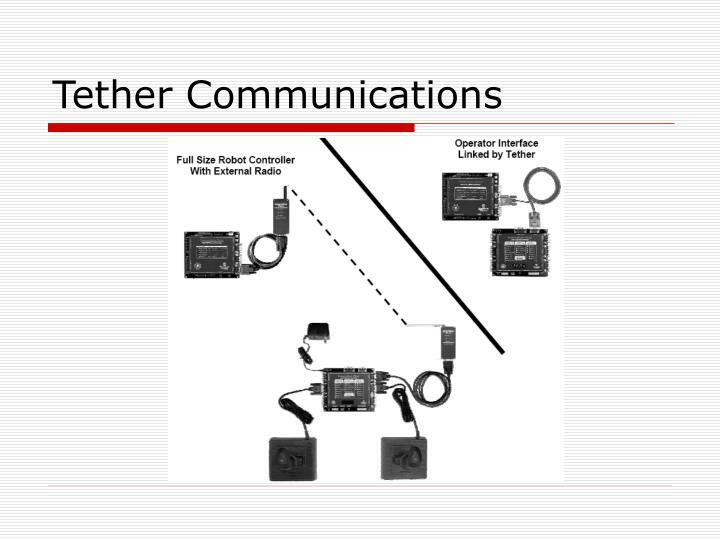 If the controllers ‘see’ a tether cable connection, then they will communicate via the tether port. 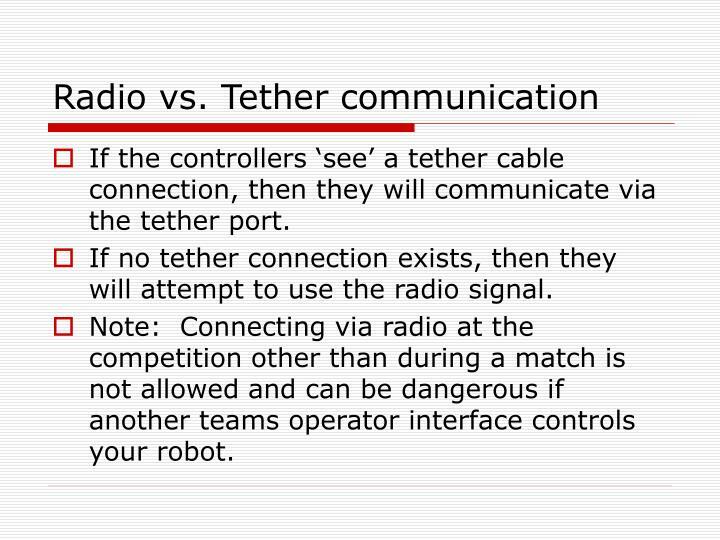 If no tether connection exists, then they will attempt to use the radio signal. 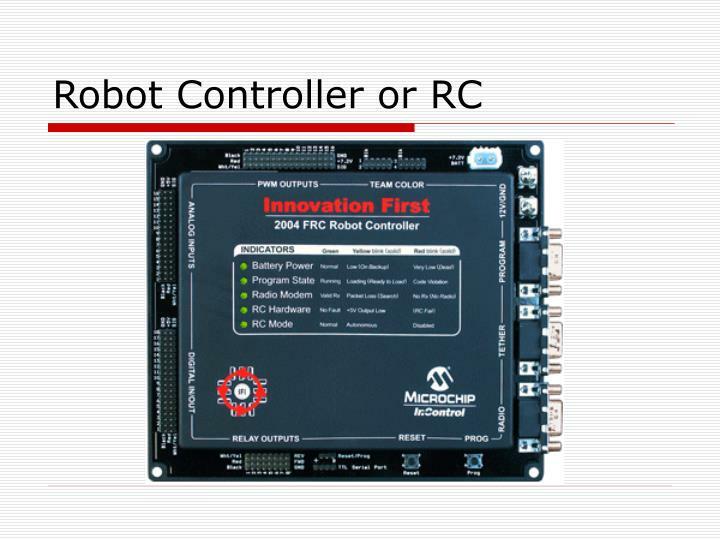 Note: Connecting via radio at the competition other than during a match is not allowed and can be dangerous if another teams operator interface controls your robot. Understanding the controls will help to understand the software variables and how the software is modifying and outputting them to get the Robot to move. 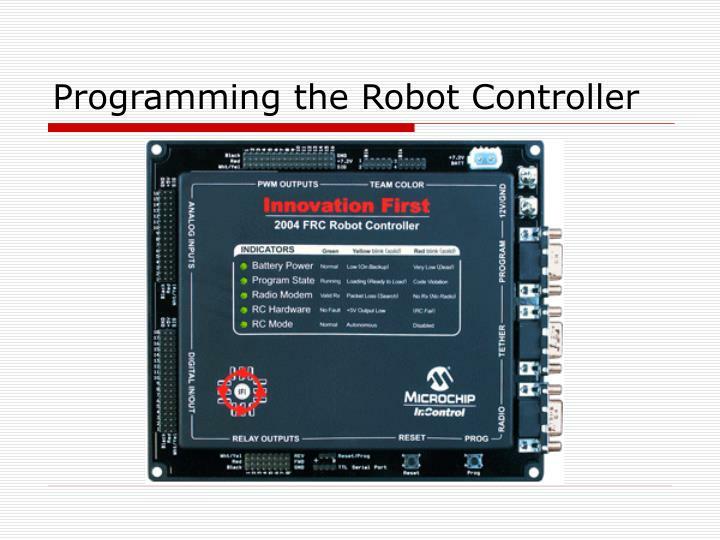 The joystick is read by the Operator Interface and is transmitted to the Robot Controller. 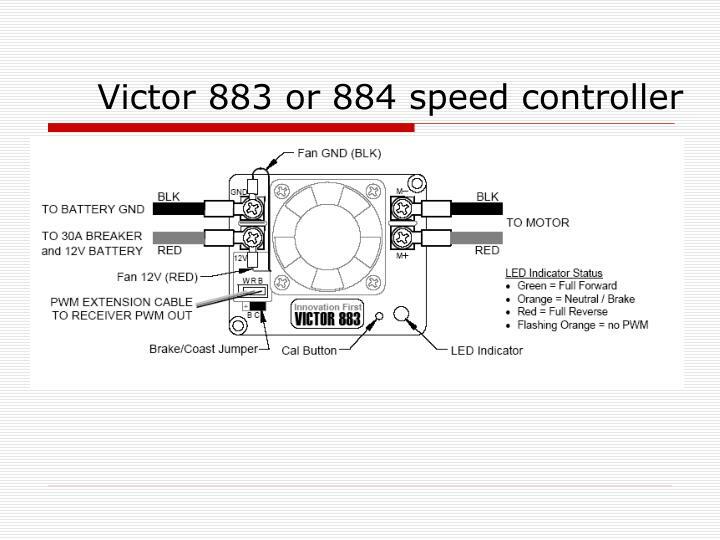 It usually drives a pwm output which controls a Victor 883 or 884 speed controller. The speed controller maybe wired to a drill motor. 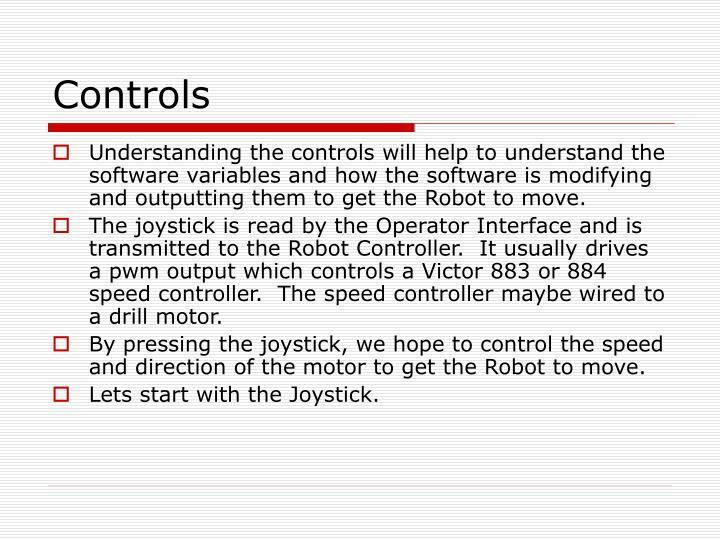 By pressing the joystick, we hope to control the speed and direction of the motor to get the Robot to move. Lets start with the Joystick. 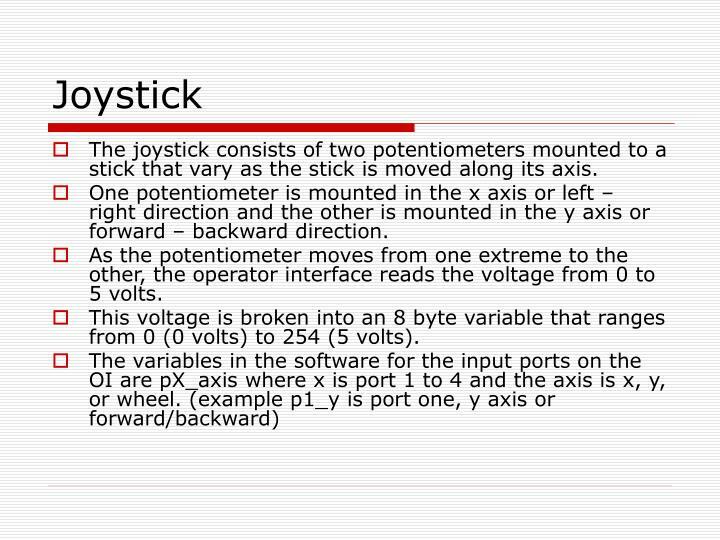 The joystick consists of two potentiometers mounted to a stick that vary as the stick is moved along its axis. One potentiometer is mounted in the x axis or left – right direction and the other is mounted in the y axis or forward – backward direction. 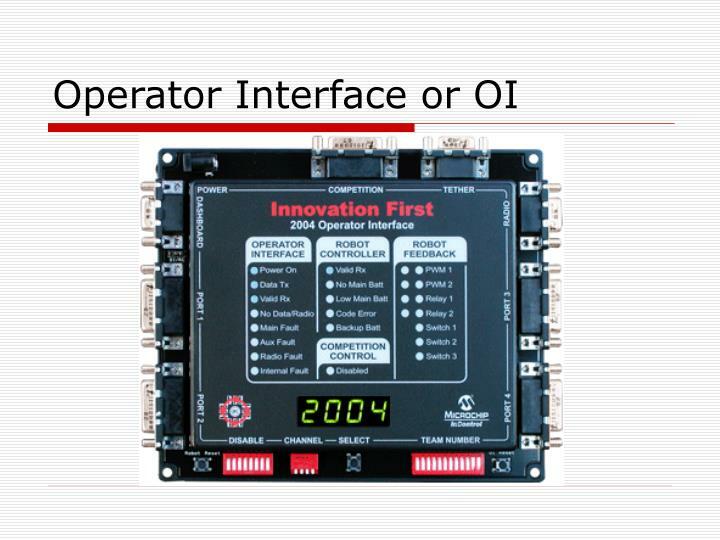 As the potentiometer moves from one extreme to the other, the operator interface reads the voltage from 0 to 5 volts. This voltage is broken into an 8 byte variable that ranges from 0 (0 volts) to 254 (5 volts). Full forward in the y axis will result in p1_y = 254. 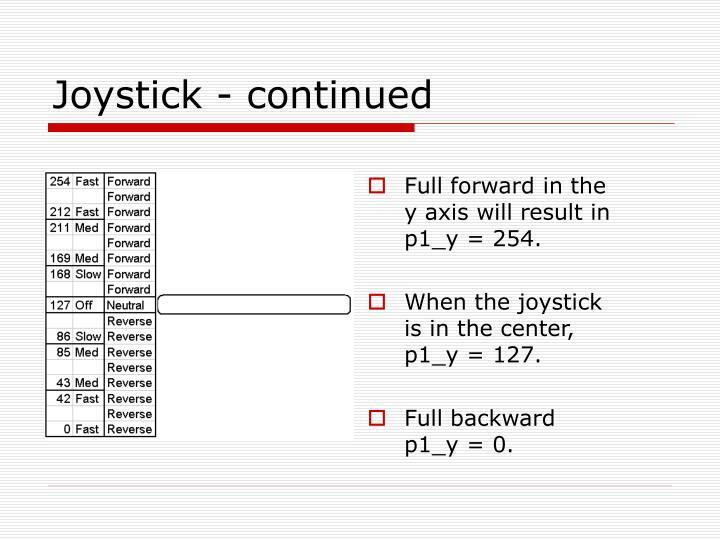 When the joystick is in the center, p1_y = 127. 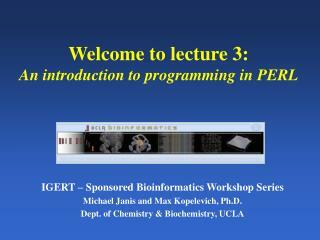 Full backward p1_y = 0. 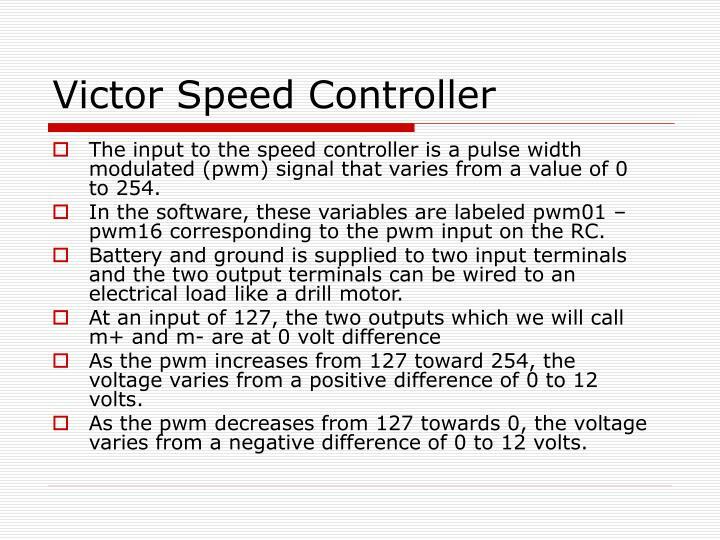 The input to the speed controller is a pulse width modulated (pwm) signal that varies from a value of 0 to 254. 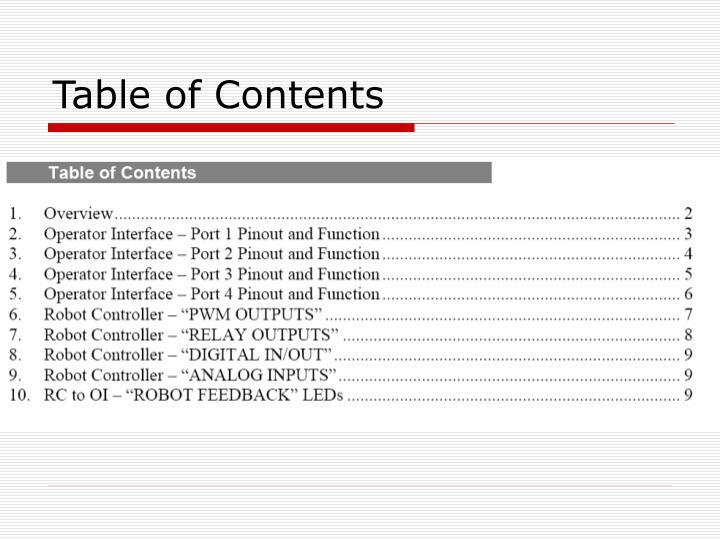 In the software, these variables are labeled pwm01 – pwm16 corresponding to the pwm input on the RC. Battery and ground is supplied to two input terminals and the two output terminals can be wired to an electrical load like a drill motor. As the pwm increases from 127 toward 254, the voltage varies from a positive difference of 0 to 12 volts. As the pwm decreases from 127 towards 0, the voltage varies from a negative difference of 0 to 12 volts. 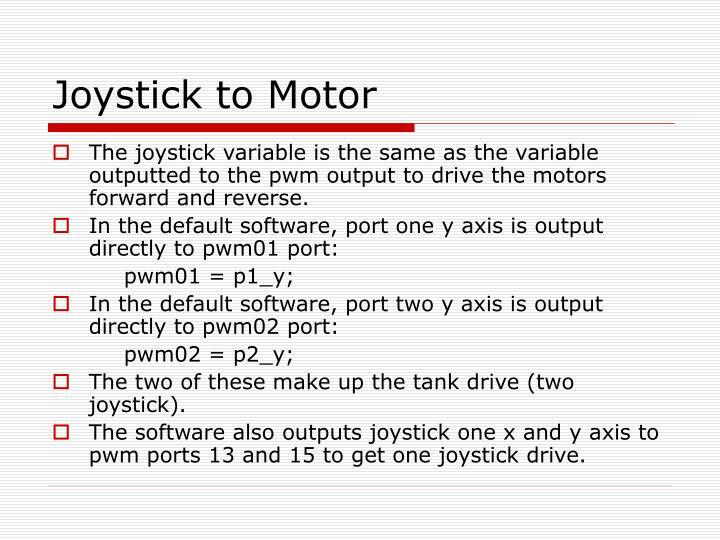 The joystick variable is the same as the variable outputted to the pwm output to drive the motors forward and reverse. The two of these make up the tank drive (two joystick). 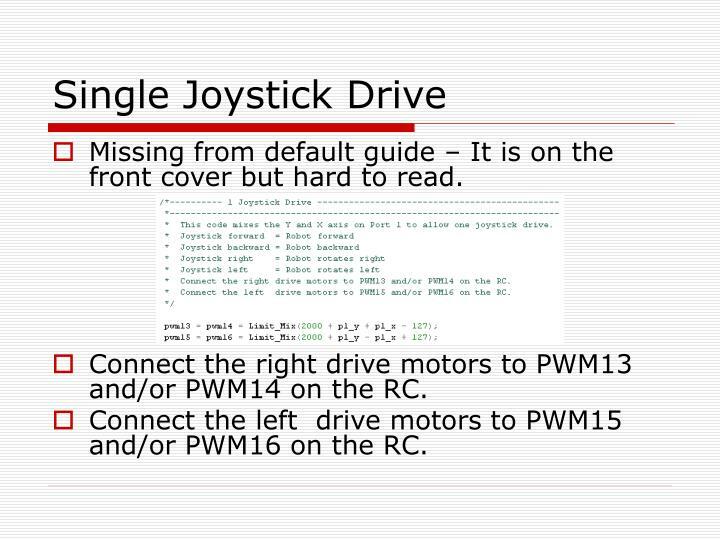 The software also outputs joystick one x and y axis to pwm ports 13 and 15 to get one joystick drive. 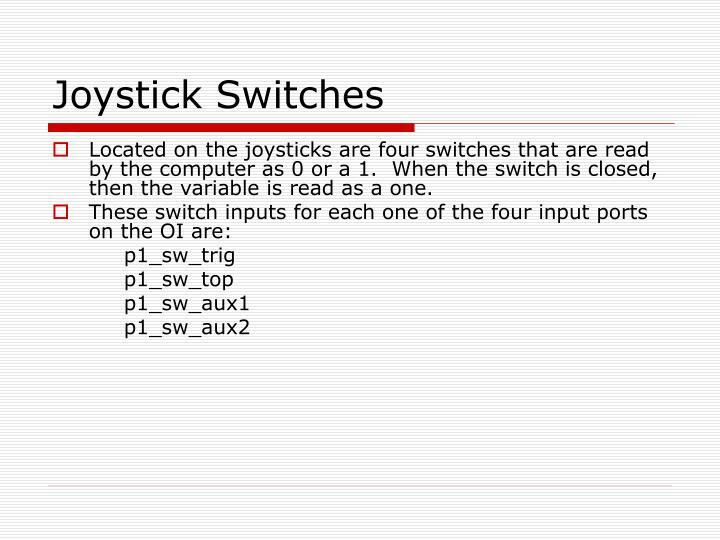 Located on the joysticks are four switches that are read by the computer as 0 or a 1. When the switch is closed, then the variable is read as a one. 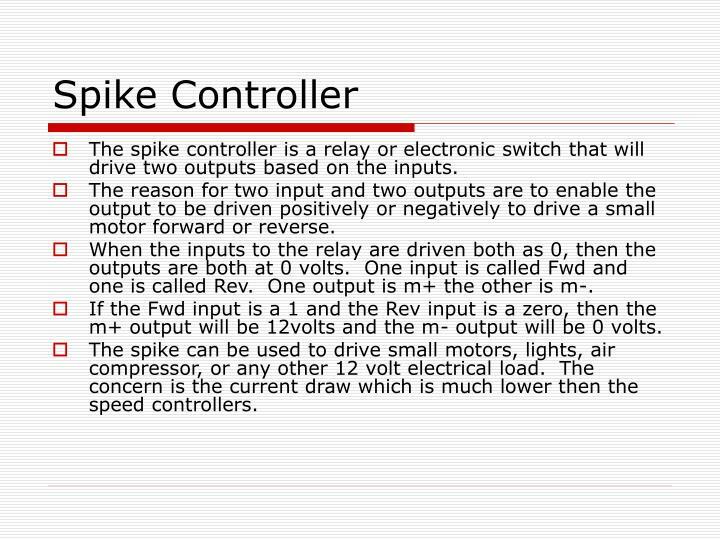 The spike controller is a relay or electronic switch that will drive two outputs based on the inputs. The reason for two input and two outputs are to enable the output to be driven positively or negatively to drive a small motor forward or reverse. When the inputs to the relay are driven both as 0, then the outputs are both at 0 volts. One input is called Fwd and one is called Rev. One output is m+ the other is m-. If the Fwd input is a 1 and the Rev input is a zero, then the m+ output will be 12volts and the m- output will be 0 volts. 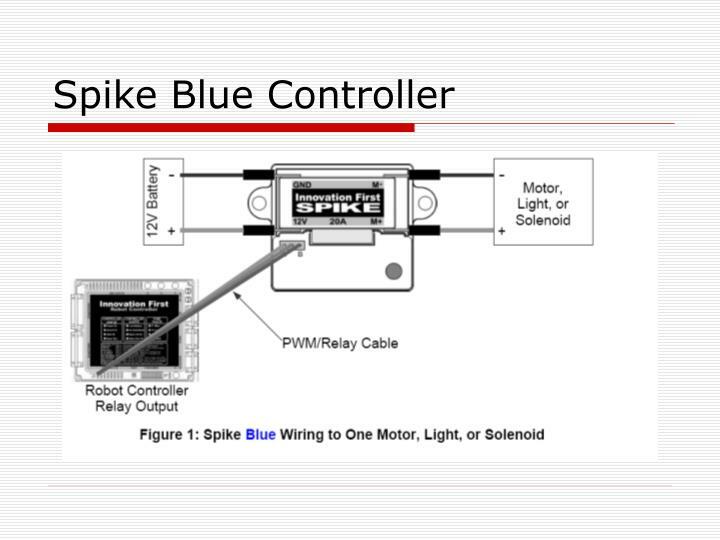 The spike can be used to drive small motors, lights, air compressor, or any other 12 volt electrical load. The concern is the current draw which is much lower then the speed controllers. 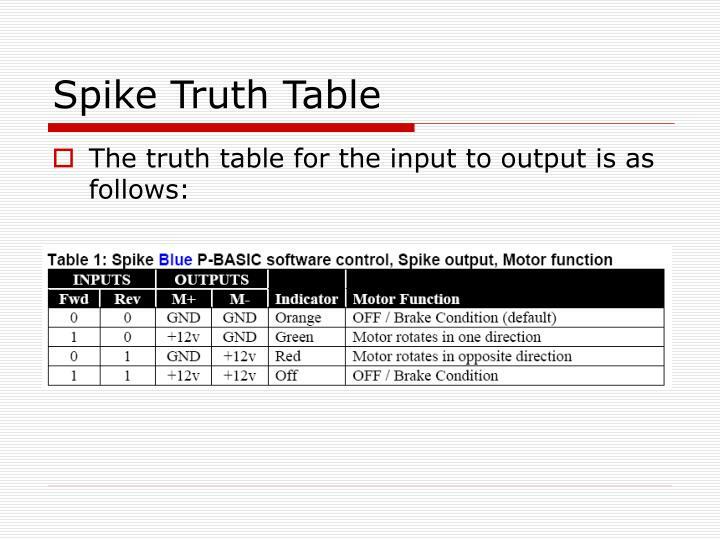 The spike can also be used to drive two different outputs in a on/off sequence. 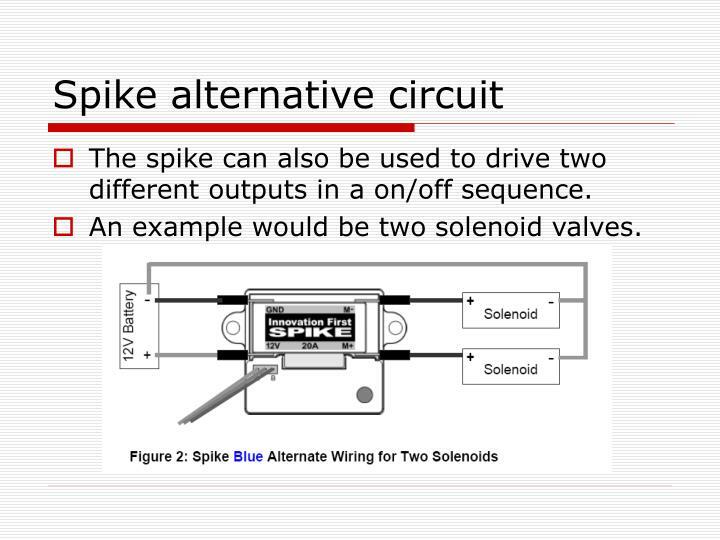 An example would be two solenoid valves. 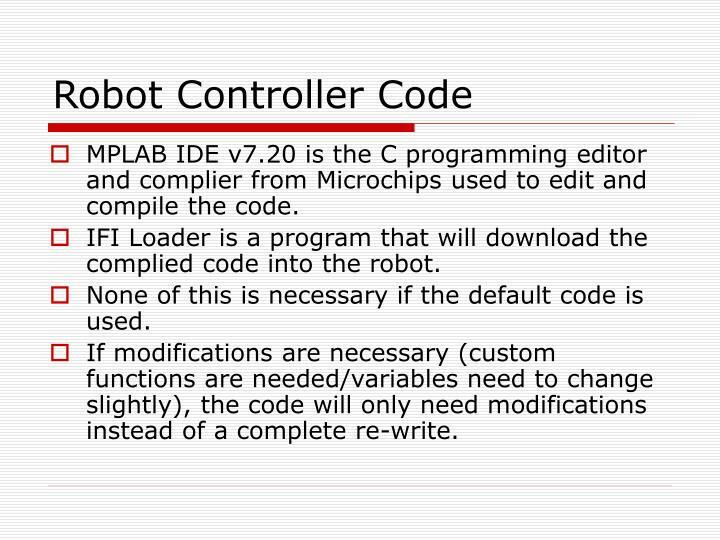 MPLAB IDE v7.20 is the C programming editor and complier from Microchips used to edit and compile the code. 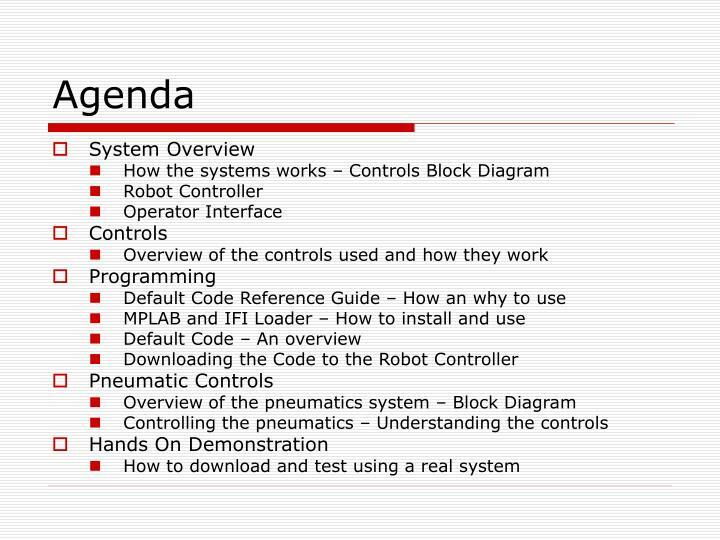 IFI Loader is a program that will download the complied code into the robot. None of this is necessary if the default code is used. If modifications are necessary (custom functions are needed/variables need to change slightly), the code will only need modifications instead of a complete re-write. 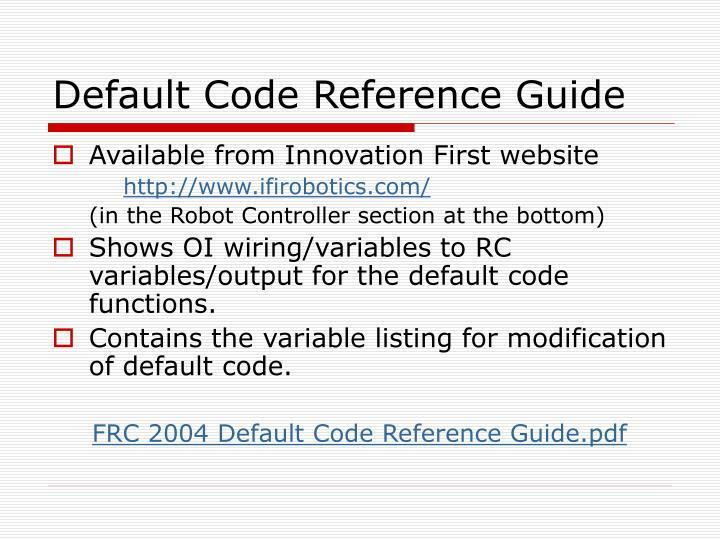 Shows OI wiring/variables to RC variables/output for the default code functions. 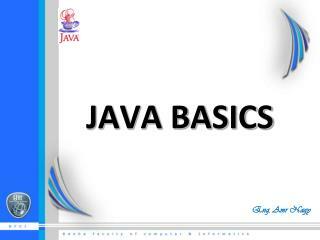 Contains the variable listing for modification of default code. 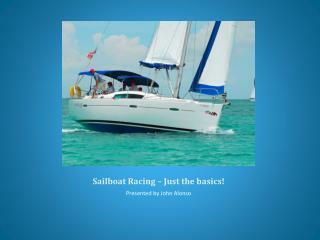 Missing from default guide – It is on the front cover but hard to read. 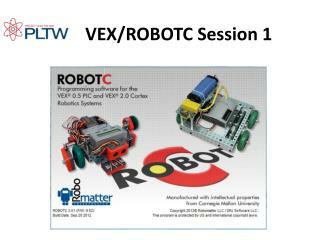 Connect the right drive motors to PWM13 and/or PWM14 on the RC. Connect the left drive motors to PWM15 and/or PWM16 on the RC. 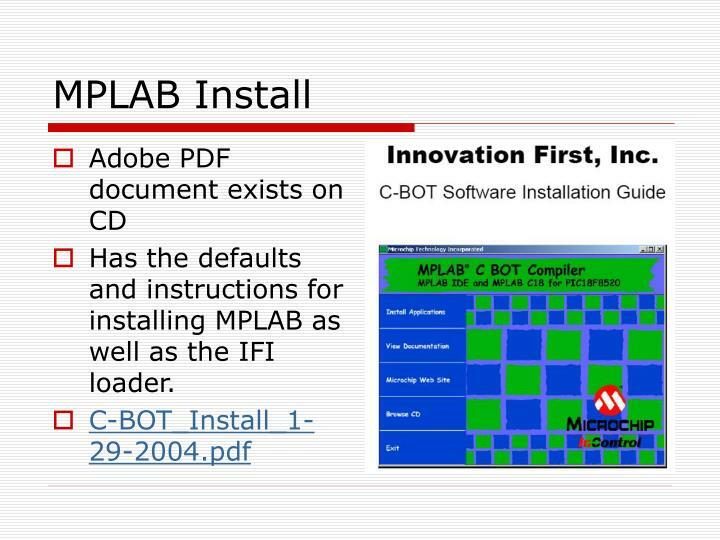 Has the defaults and instructions for installing MPLAB as well as the IFI loader. After downloading the default code, place the unzipped files in a directory, preferable in c:\code\frccode. 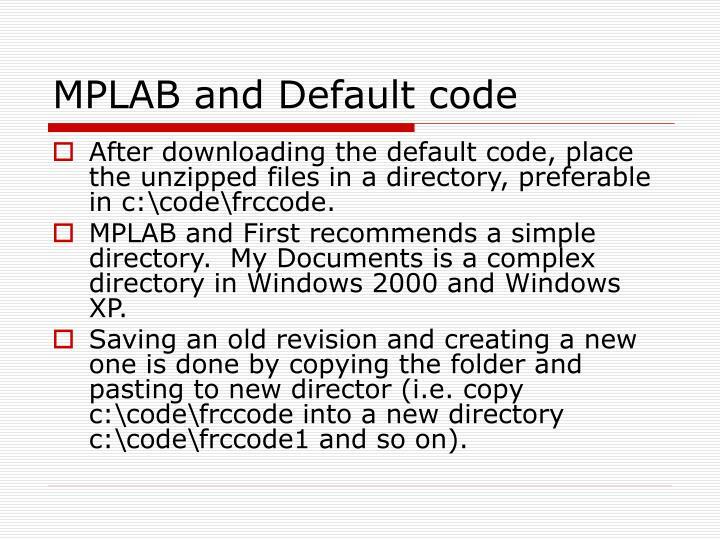 MPLAB and First recommends a simple directory. My Documents is a complex directory in Windows 2000 and Windows XP. Saving an old revision and creating a new one is done by copying the folder and pasting to new director (i.e. copy c:\code\frccode into a new directory c:\code\frccode1 and so on). Do not use the file open command. 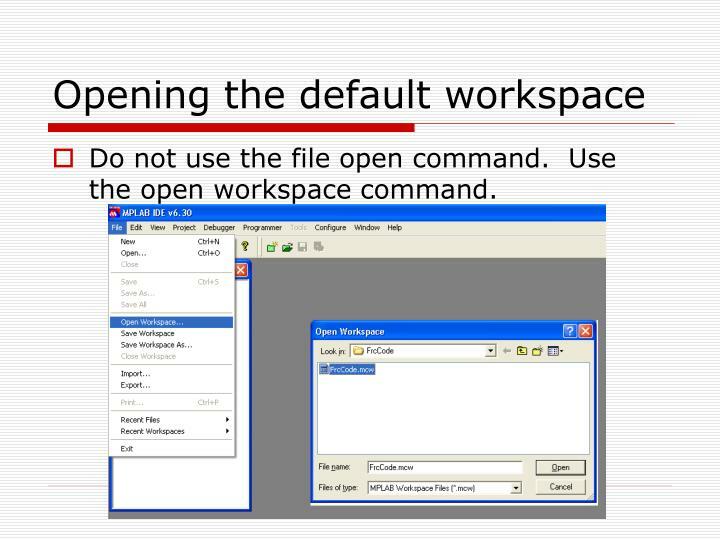 Use the open workspace command. Custom code should be placed in Process_Data_From_Master_uP function at /* Add your own code here */. 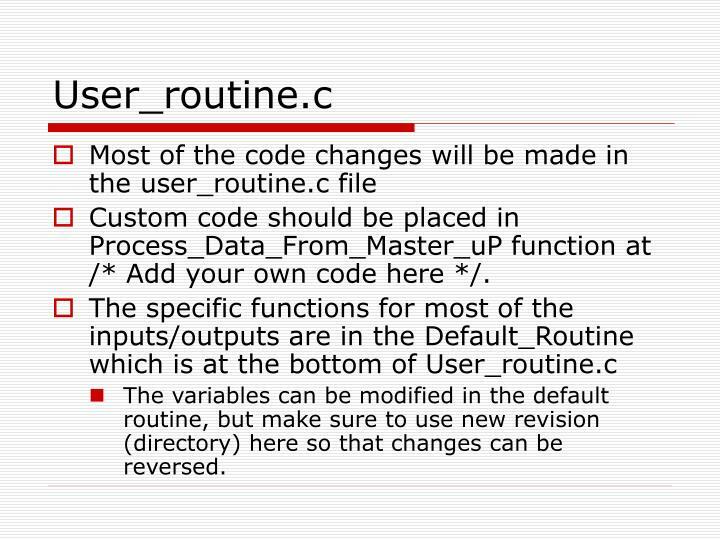 The variables can be modified in the default routine, but make sure to use new revision (directory) here so that changes can be reversed. 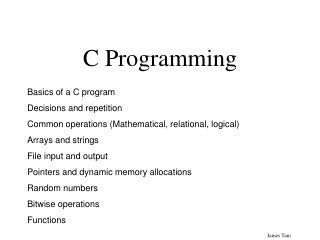 C is a popular powerful language that requires conciseness with a wealth of operators. 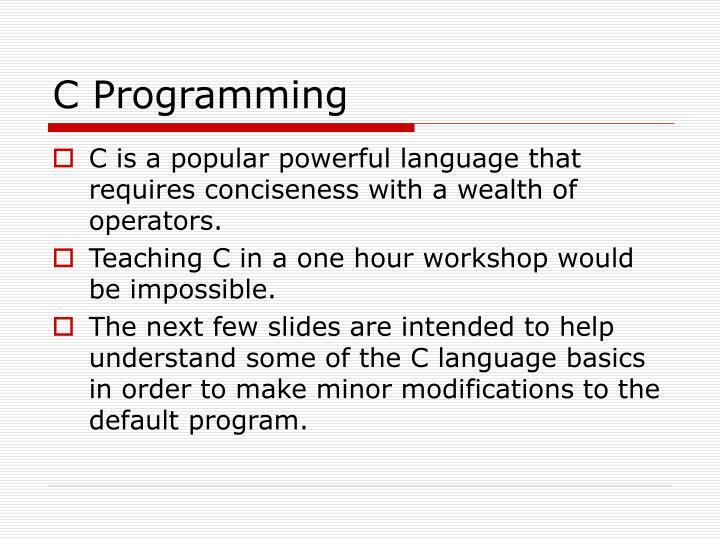 Teaching C in a one hour workshop would be impossible. 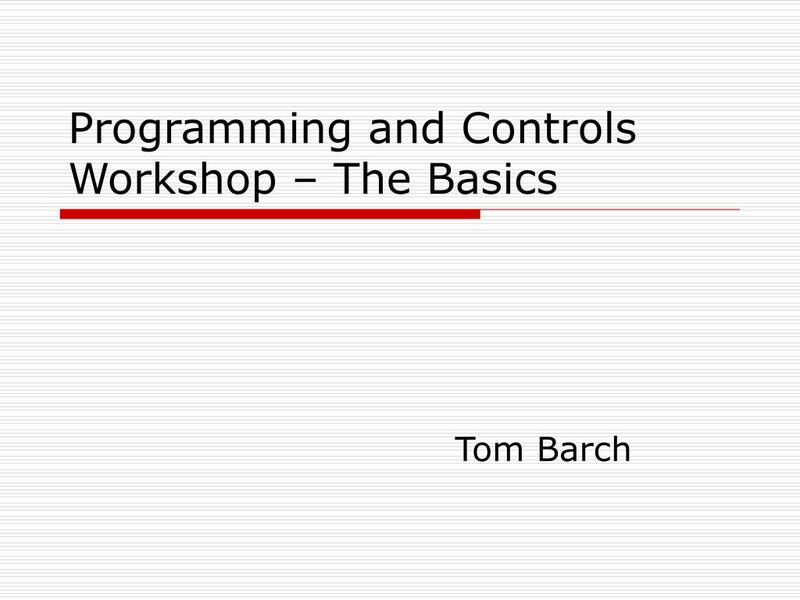 The next few slides are intended to help understand some of the C language basics in order to make minor modifications to the default program. 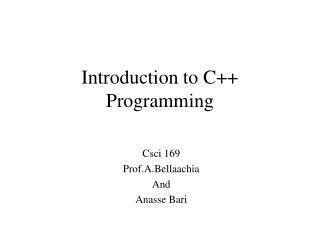 C is a compiled language. 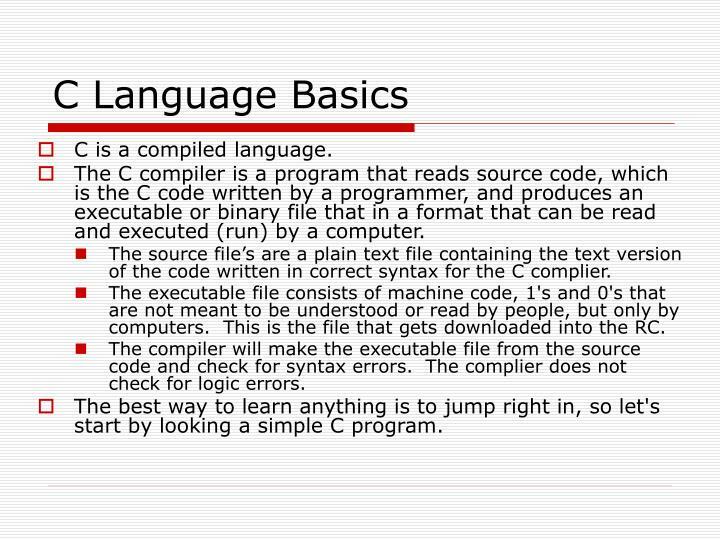 The C compiler is a program that reads source code, which is the C code written by a programmer, and produces an executable or binary file that in a format that can be read and executed (run) by a computer. 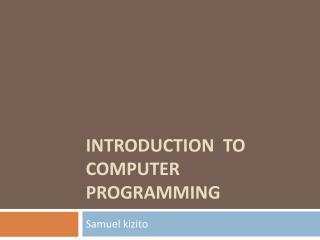 The source file’s are a plain text file containing the text version of the code written in correct syntax for the C complier. 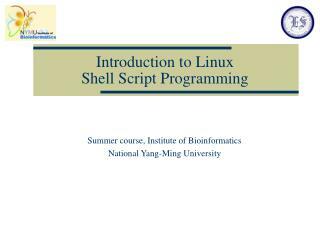 The executable file consists of machine code, 1's and 0's that are not meant to be understood or read by people, but only by computers. This is the file that gets downloaded into the RC. 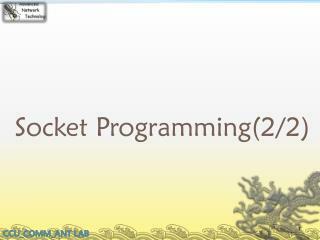 The compiler will make the executable file from the source code and check for syntax errors. The complier does not check for logic errors. 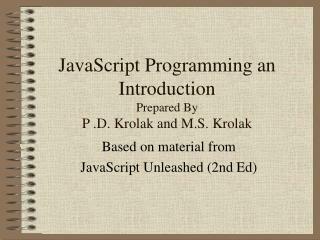 The best way to learn anything is to jump right in, so let's start by looking a simple C program. 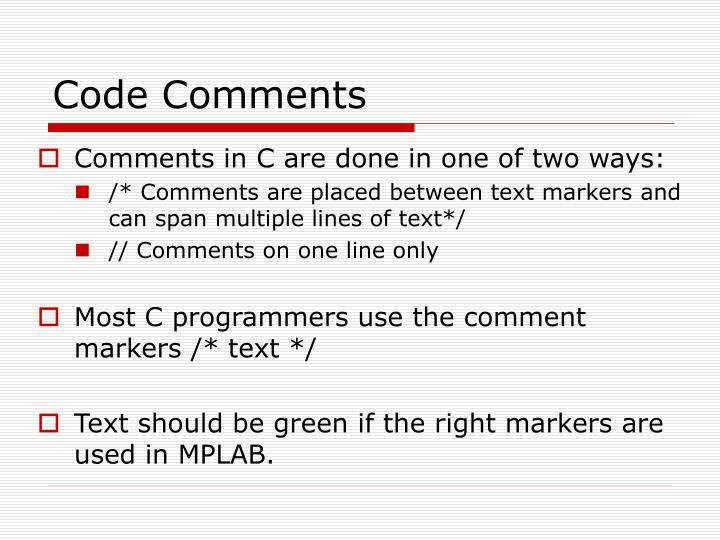 Text should be green if the right markers are used in MPLAB. You may have noticed the == sign used in the if statement. 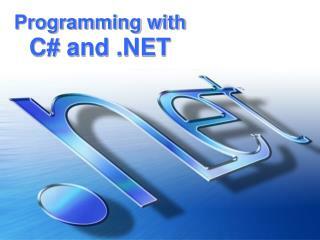 Unlike most other programming languages, the = is an assignment operator. 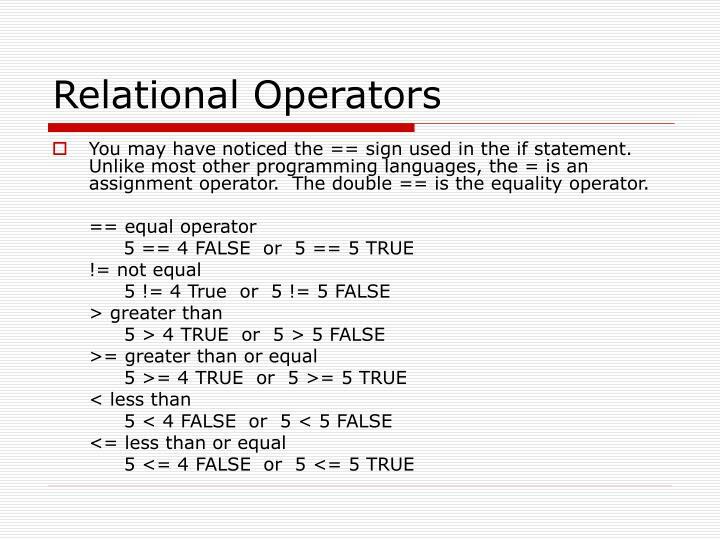 The double == is the equality operator. Braces mark the beginning as well as the end of the body of a function. 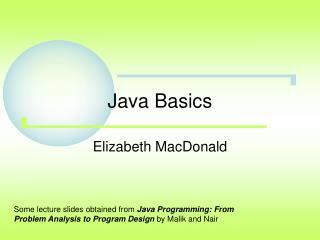 Valid names can consist of letters, numbers and the underscore, but may not start with a number. 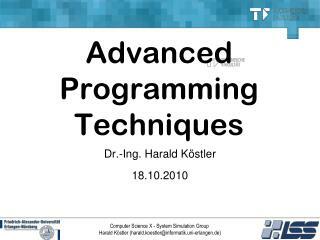 A variable name may not be a C keyword such as if, for, else, or while. Variable names are case sensitive. 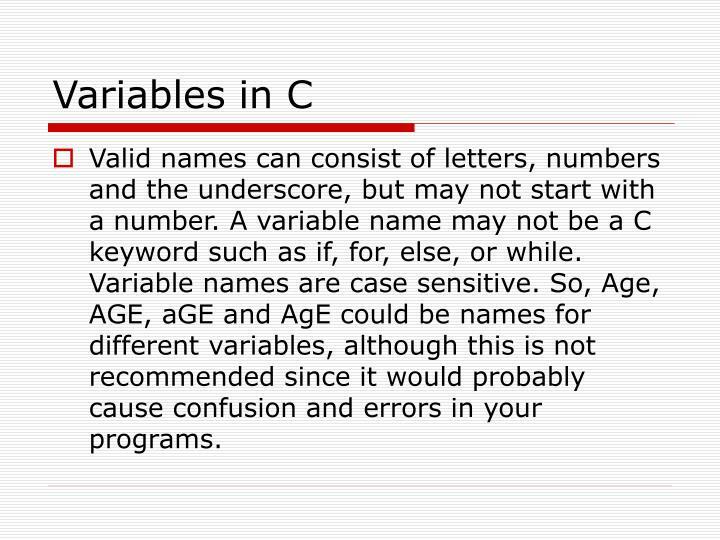 So, Age, AGE, aGE and AgE could be names for different variables, although this is not recommended since it would probably cause confusion and errors in your programs. Variables are usually declared at the top of the module or in a separate “header” file which usually ends with .h file type. 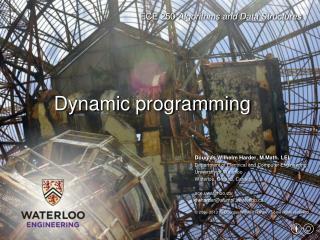 In the space before the variable or function being declared, is the data type the variable or function will return. 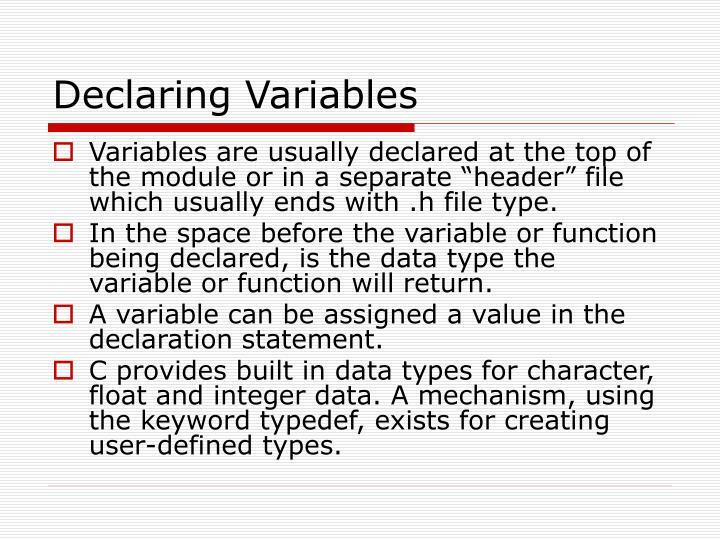 A variable can be assigned a value in the declaration statement. 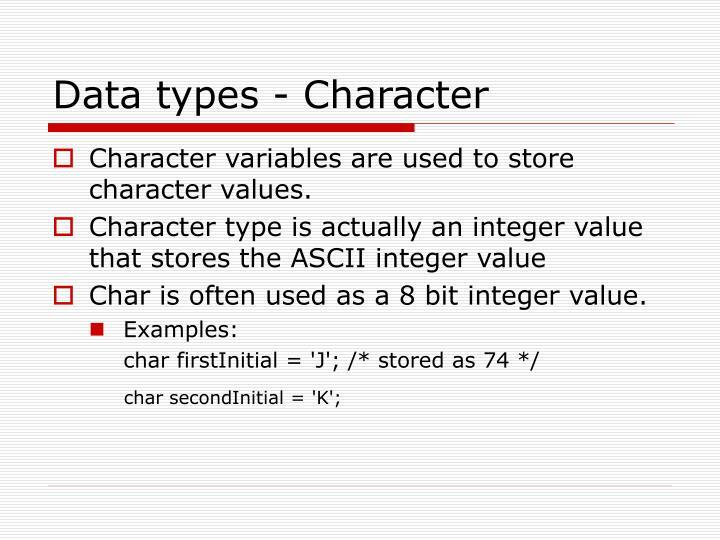 C provides built in data types for character, float and integer data. A mechanism, using the keyword typedef, exists for creating user-defined types. 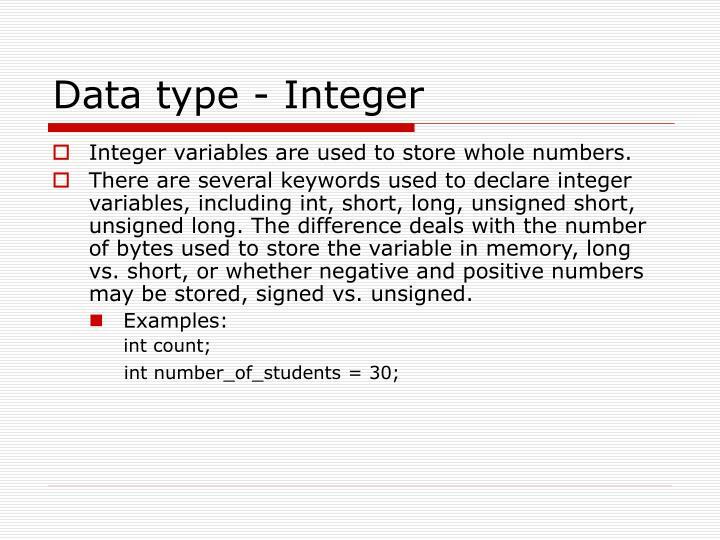 Integer variables are used to store whole numbers. There are several keywords used to declare integer variables, including int, short, long, unsigned short, unsigned long. The difference deals with the number of bytes used to store the variable in memory, long vs. short, or whether negative and positive numbers may be stored, signed vs. unsigned. 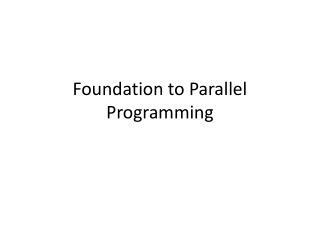 Float variables are used to store floating point numbers. Floating point numbers may contain both a whole and fractional part, for example, 52.7 or 3.33333333. 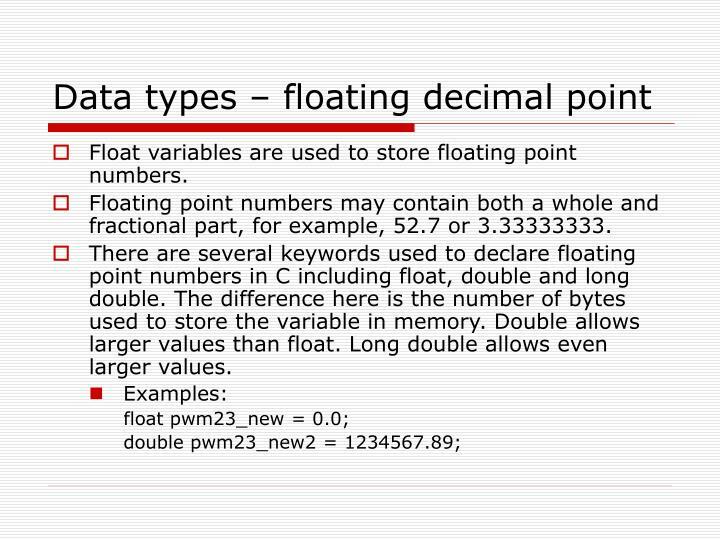 There are several keywords used to declare floating point numbers in C including float, double and long double. The difference here is the number of bytes used to store the variable in memory. Double allows larger values than float. Long double allows even larger values. Character variables are used to store character values. Char is often used as a 8 bit integer value. 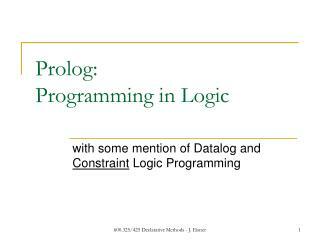 The preprocessor is a program that modifies your source file prior to compilation. #define, which is used to define a constant. 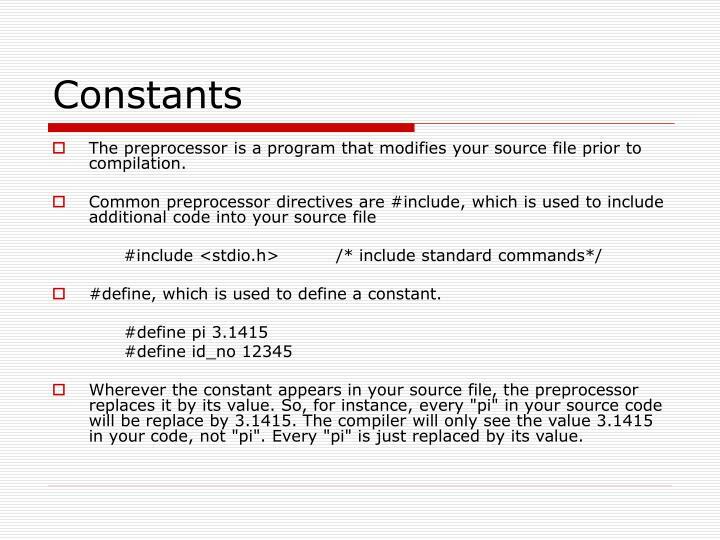 Wherever the constant appears in your source file, the preprocessor replaces it by its value. So, for instance, every "pi" in your source code will be replace by 3.1415. The compiler will only see the value 3.1415 in your code, not "pi". Every "pi" is just replaced by its value. 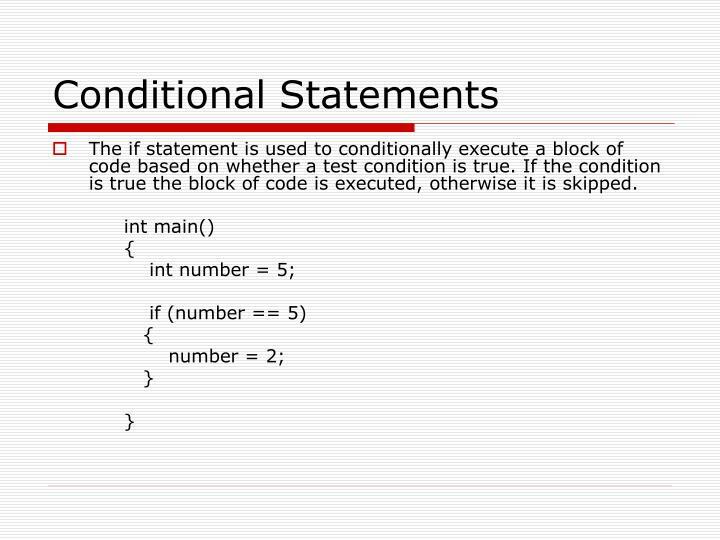 The if statement is used to conditionally execute a block of code based on whether a test condition is true. 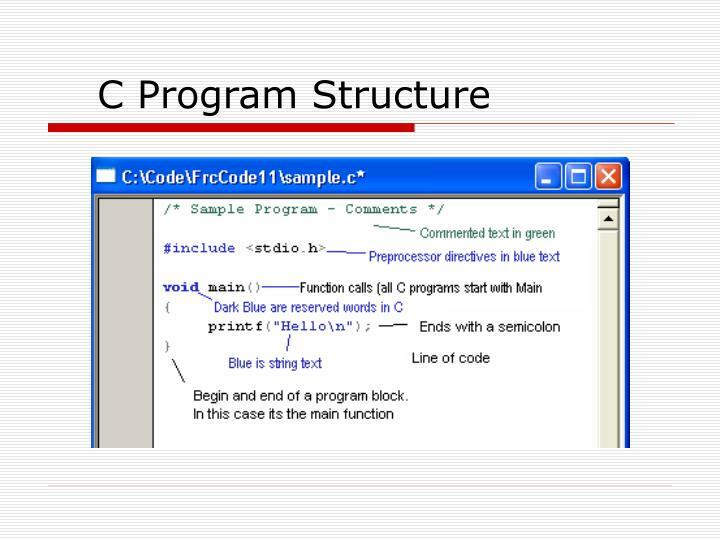 If the condition is true the block of code is executed, otherwise it is skipped. 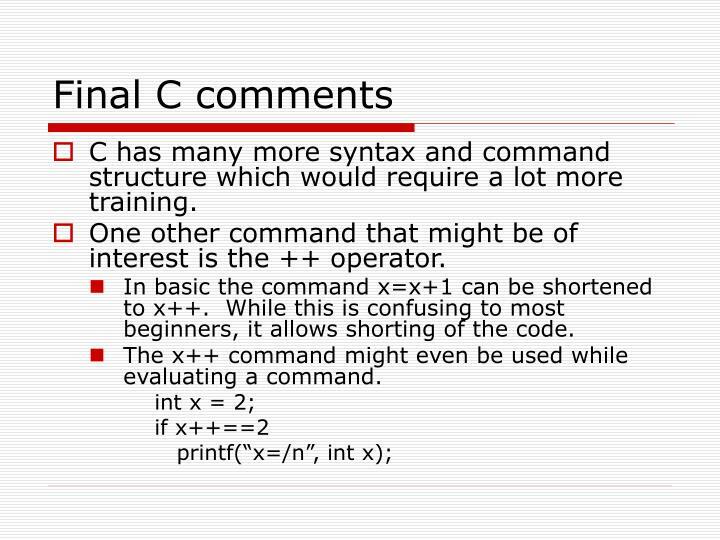 C has many more syntax and command structure which would require a lot more training. One other command that might be of interest is the ++ operator. 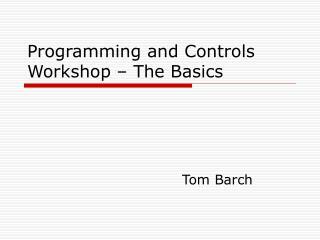 In basic the command x=x+1 can be shortened to x++. While this is confusing to most beginners, it allows shorting of the code. The x++ command might even be used while evaluating a command. 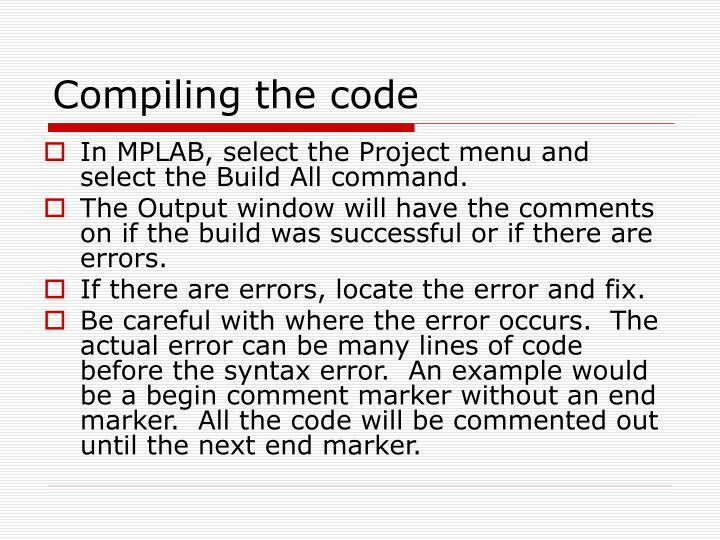 In MPLAB, select the Project menu and select the Build All command. The Output window will have the comments on if the build was successful or if there are errors. If there are errors, locate the error and fix. Be careful with where the error occurs. 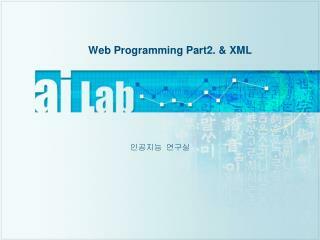 The actual error can be many lines of code before the syntax error. An example would be a begin comment marker without an end marker. 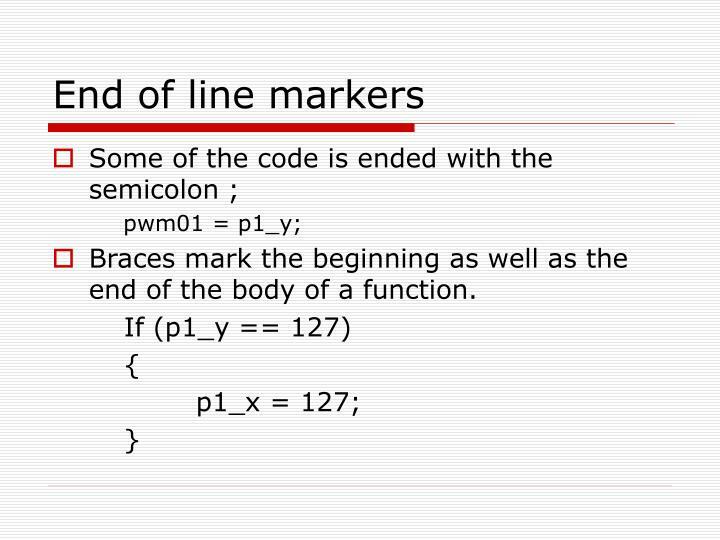 All the code will be commented out until the next end marker. 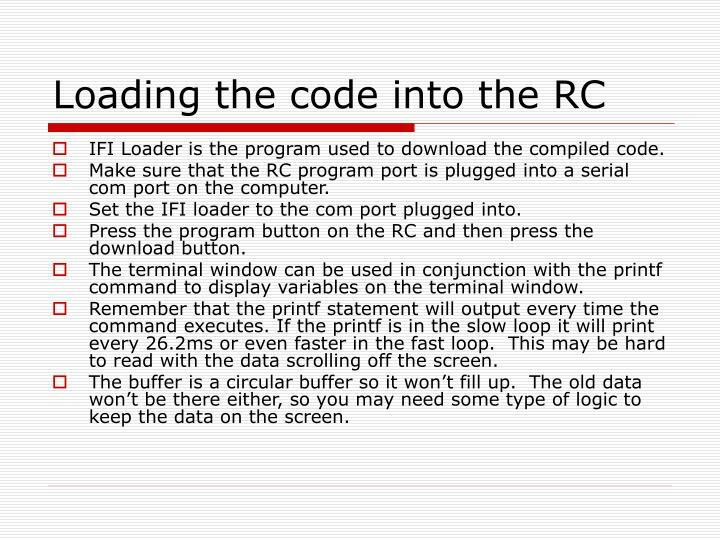 IFI Loader is the program used to download the compiled code. 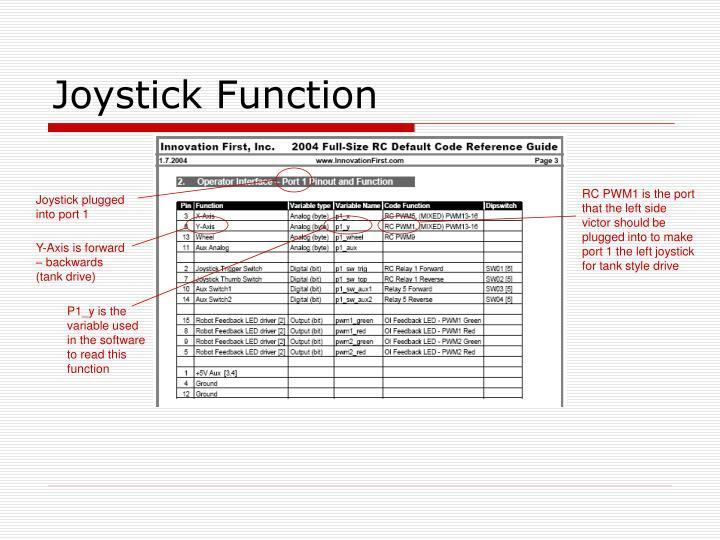 Make sure that the RC program port is plugged into a serial com port on the computer. Set the IFI loader to the com port plugged into. Press the program button on the RC and then press the download button. The terminal window can be used in conjunction with the printf command to display variables on the terminal window. Remember that the printf statement will output every time the command executes. If the printf is in the slow loop it will print every 26.2ms or even faster in the fast loop. This may be hard to read with the data scrolling off the screen. The buffer is a circular buffer so it won’t fill up. The old data won’t be there either, so you may need some type of logic to keep the data on the screen. The air compressor is wired through a relay controlled by the pressure switch. When the pressure switch drops below the set switch point, the relay is energized turning on the air compressor. When the pressure exceeds the set switch point, the relay is de-energized turning off the air compressor. 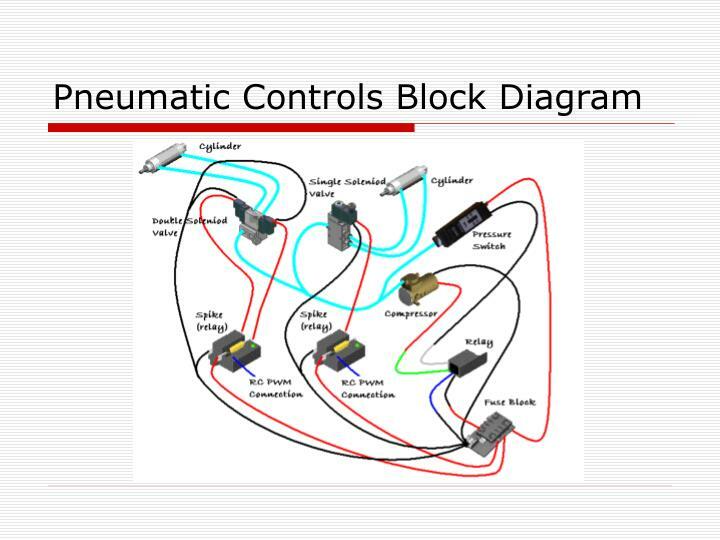 Controlling the pneumatic cylinders is then accomplished through a single or double solenoid valve. “Single-acting” or single solenoid valve will extend the air cylinder while the solenoid is energized. 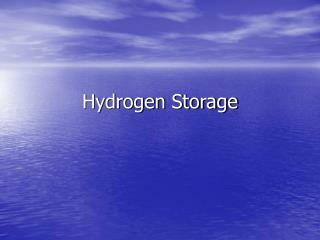 When the solenoid is de-energized, the air cylinder will close. 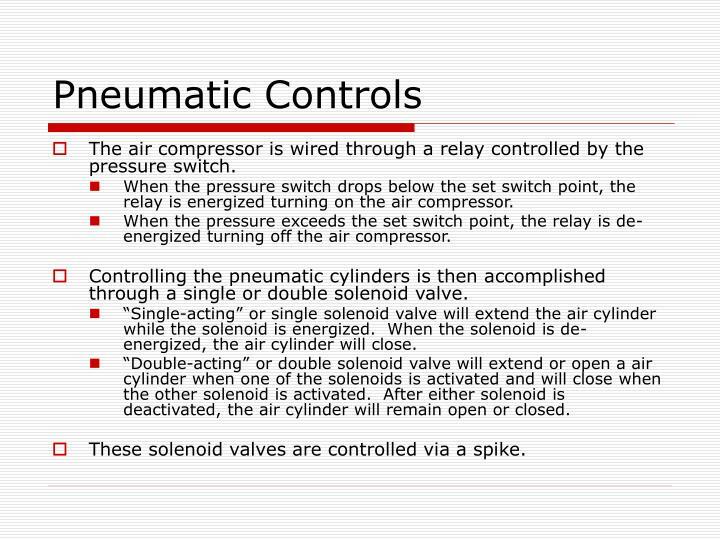 “Double-acting” or double solenoid valve will extend or open a air cylinder when one of the solenoids is activated and will close when the other solenoid is activated. After either solenoid is deactivated, the air cylinder will remain open or closed. 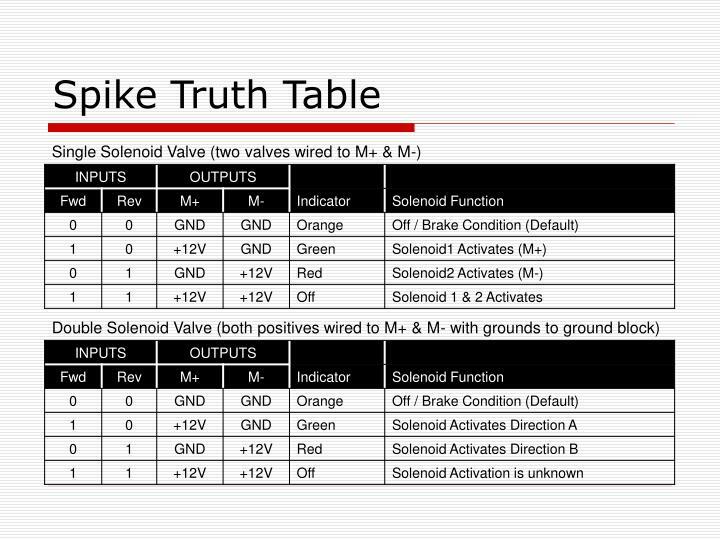 These solenoid valves are controlled via a spike. There are other websites for resources. 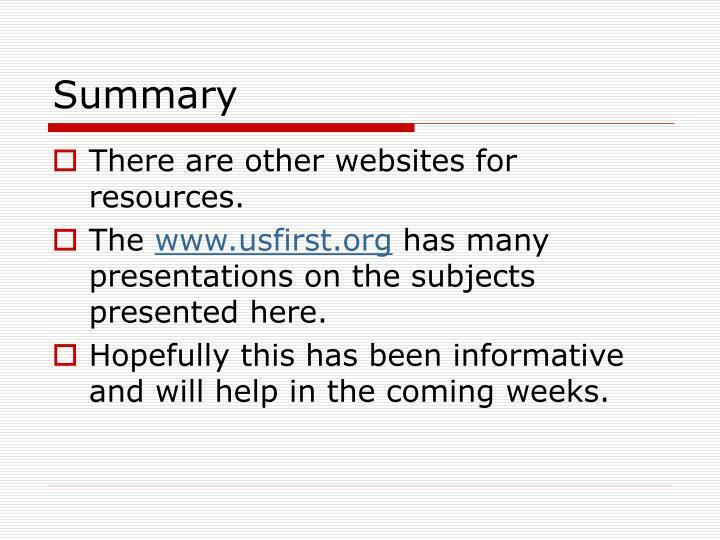 The www.usfirst.org has many presentations on the subjects presented here. Hopefully this has been informative and will help in the coming weeks. 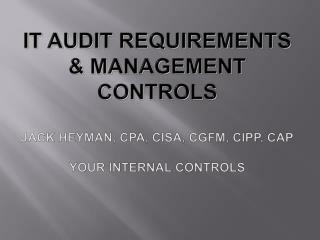 Agenda -It audit requirements &amp; management controls jack heyman, cpa, cisa, cgfm, cipp, cap your internal controls. agenda. 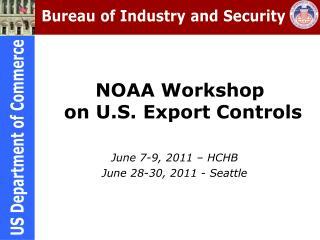 introduction comments regulation / guidance internal controls coso a-123 sas 55 yellow book sas 112. 1. 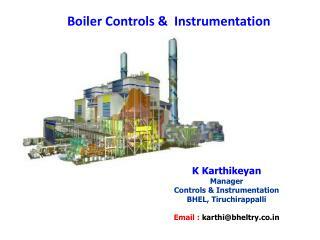 Access Controls -. 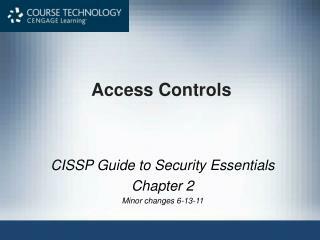 cissp guide to security essentials chapter 2 minor changes 6-13-11. objectives. identification and authentication centralized access control decentralized access control access control attacks testing access controls.